Home» » AP INSPIRE State Awards Scheme 2017-18 Sanction Order. 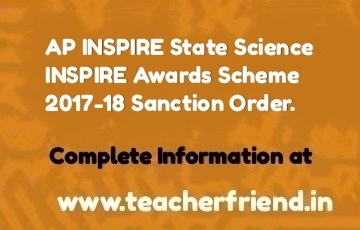 AP INSPIRE State Awards Scheme 2017-18 Sanction Order. Andhra Pradesh INSPIRE Science State Awards Sanction Order Download/AP Science INSPIRE Sanction Order amount of Rs 2,75,40,000/- (Rupees Two Crores Seventy-Five Lakhs Forty Thousand Only) towards disbursement of INSPIRE State Awards Scheme Download. selected students of various schools in the state/UT of Andhra Pradesh as per the list attached. Get Download Awards Click Here.